Here is a brief over view of one of the technique I use to achieve such unique looking results. Mokume Gane is a traditional Japanese method for laminating various colors of metals together and manipulated them to create patterns that resemble wood patterns. 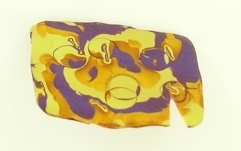 Polymer clay lends itself perfectly to creating patterns from layers of oven-bake clay, manipulating them and removing slices. Layers of clay are manipulated with rubber stamps, texture sheets, needle tools, balls of clay strategically placed under the stack and found objects. Gold, silver or copper leaf may be added between the layers of clay for some very interesting results. Though each project is different, there are basic steps to follow when creating my art. First I roll out several sheets of clay with various degrees of thickness. Next, I stack these sheets of clay and compress them with my hand or an acrylic roller. 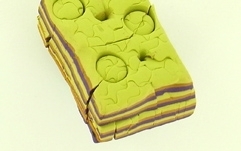 When these stacks are compressed, I use various tools to distress and manipulate the clay and give it the look I desire. 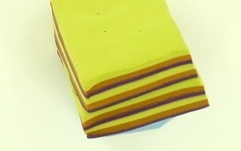 Afterwards, I recomprress the stack and slice through the clay to create the desired shape.